Highgate’s main roads have illegal and health-damaging levels of air pollution according to the first set of results from the community’s survey. purple pins show the locations of the highest pollution – at least 50µg/m3 (micrograms per cubic metre). white pins indicate where no reading was validated. diamonds are locations of readings by other organisations in previous years. The pattern is quite clear. Highgate’s main roads have very high – illegal – levels of NO2 pollution. The two purple readings on Highgate Hill and the High Street were both 54µg/m3 (micrograms per cubic metre). The red readings (on Archway Road and Aylmer Road) are between 40 and 49µg/m3. These are above the legal limit of 40µg/m3. This represents a serious and persistent health risk at the heart of our community. Most of the readings on the secondary roads in the area, including Hampstead Lane, North Hill, North Road, Shepherds Hill and Hornsey Lane, were between 30 and 40µg/m3 (and are marked orange on the map). The side roads all had readings below 30µg/m3 with the lowest being just under 20, on Hampstead Heath and in Queens Wood. 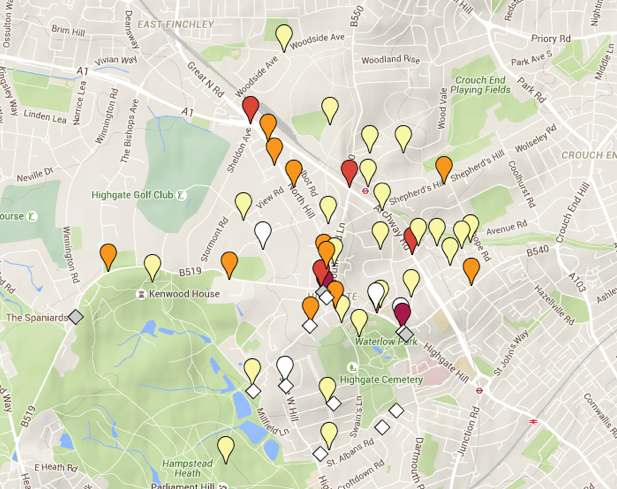 The Highgate Neighbourhood Forum financed the survey by crowd funding and worked with pupils from Highgate School to place 45 sensors around Highgate to measure NO2 levels. (The sensors were put up in mid-March and collected, to be sent for processing, a month later. See some background here.) Some 41 sensors returned valid results as four were removed or in some way damaged. The full report on air quality in Highgate puts these survey results into the context of other data that exist for the area. It gives responses to a number of FAQs, explaining for example the health risks (that contribute to about 10,000 premature deaths a year in London) and why the precise location of the diffusion tubes is very important. The survey results suggest that dangerous levels of NO2 do not travel very far. This is good news. Although breathing the air on our main roads is not to be advised, it does mean that back gardens of houses or pubs on the main roads do not suffer from anything like the same problem. We are hoping to repeat some of the readings later in the year and learn more about the impact of distance and trees in reducing pollution is something we will look at given we now have a good overall picture of Highgate’s pollution hot spots. What can we do in Highgate? Air pollution in Highgate is largely due to the vast number of vehicles that travel through the area, mainly on the two main north-south arteries. It is not just personal vehicles but also HGVs, buses and taxis that emit pollution. We do not have pollution source figures for Highgate but, as explained in the full report, goods vehicles contribute as much as private cars, and that taxis, buses and rail together contribute more. While there’s only so much that we, as a community can do, we hope that this survey will raise awareness and galvanise action in both local campaigns and for change extending beyond Highgate. The power to make the changes of greatest impact rests with central government and the London Mayor, rather than local authorities. But the Highgate Forum is doing what it can. We have added elements to the draft neighbourhood plan to reflect this emerging issue. For example, one policy, DH9, says that planning permission will only be given for developments on main roads (where pollution is high) if appropriate measures are taken to protect the users of the building from the pollution. Other policies consider car-free developments. The Plan also includes a number of community actions or initiatives (not formal policies) that we hope the community will press for. Examples include: make pavements safer and roads easier to cross, adjust CPZ times to reduce commuter use of cars, providing places to lock/store bikes, and introduce green routes for cycling. We plan to present the results to TfL and ask them to prioritise the introduction of hybrid buses on the routes that pass through Highgate. Beyond that the forum will support campaigns and work with schools and other groups. Options to consider include promoting electric cars, car clubs, planting trees, encouraging large employers (such as schools and hospitals) to publish travel plans, and encouraging cycle lanes. Personal behaviour changes include walking, cycling or using public transport in the place of cars, car sharing, combining errands into fewer trips, cut idling, choose lower emission cars, keeping tyres inflated and cars regularly serviced. Homes also contribute to pollution so fuel economy and efficiency measures can a play a part too. I know what you mean. It’s not just the High Street, it’s elsewhere including Highgate Hill and always, i think, when it is a traffic queue. I’ve wondered if it’s burning clutch. Do come to the AGM if you can and ask. Failing that we will!